The first paragraph has been around a while. The second is new. If you have any editing suggestions, let me have them. When her abusive lover tries to take custody of her baby, Audra Verhailey flees where even he can’t follow: the aliens’ forbidden cities underneath Kwadra Island. But can the safety she wants for her daughter survive a search party, violent alien criminals — and the love of an emotionally damaged Kwadran? Though his life has degenerated into drinking, fighting, and physical labor, Tal Pelletier used to be a brilliant technician. When Audra asks his help finding a hidden entrance into Kwadra’s abandoned underground, it’s a second chance at life — because she and her baby remind him of the wife and child he lost. Can he protect the two females from a gang of murderous thugs . . . and the demons inside himself? Several times, I’ve paid for cover reveal blog tours. But since I’m unsure of the ROI (and because the cover wasn’t finished in time! ), I’m doing the cover reveal here and now. The mother and child speak for themselves, but the title might need a bit of explaining. 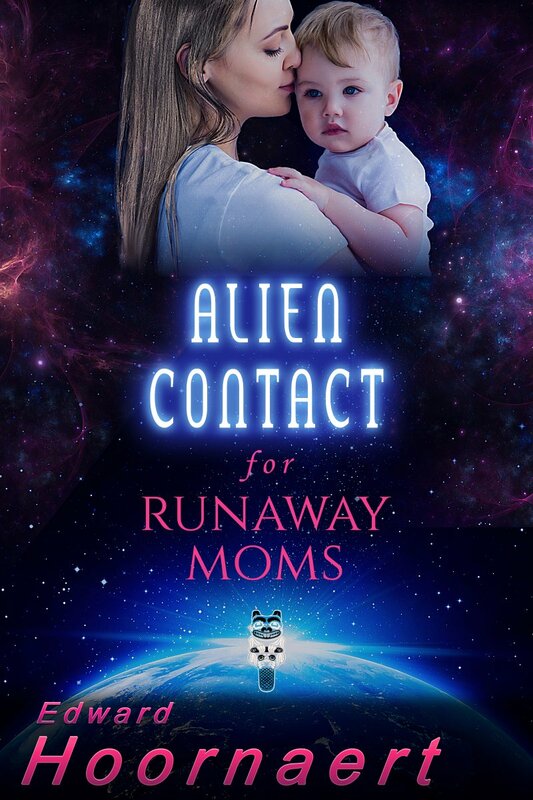 This is book five of my near-future sci fi romance series, Alien Contact for Idiots. The Earthrise and starry sky convey that this is speculative fiction, rather than a contemporary romance. The smiley creature near the bottom is a beaver totem in the style of Northwest Coast Indians, because my hero is a Native American from the future. Although I’ve been known to create some of my own covers, such as the one below from my Trilogy of Tompa Lee, this one’s too good to be my handiwork. It was designed by the talented Danielle Fine, whom I highly recommend. Be sure to check out the hooks by other great writers in the Book Hooks blog hop. I LOVE the cover, Ed! Looking forward to reading this, after all your teases. And I look forward to you reading it! Great cover and even better title. Let’s hope that between the two of them, they lure in a few buyers. Cover is great and so is the blurb. Second paragraph was needed and adds to the pull to read the book. Thanks. Although I’ve been using just the one paragraph, I felt something was lacking. interesting cover. Good luck on the release. Thanks. I’ll take all the luck I can get. Georgeous cover Ed, absolutely stunning! Wishing you much luck with the release! I’m glad the cover resonates, Hywela!